Real Madrid are no pushovers in the transfer market, so one can only imagine there will be a big response lined up after the departure of club legend Cristiano Ronaldo to Juventus. The Portugal international left for Juve in something of a shock move this summer, ending an incredible nine years at the Bernabeu in which he scored 450 goals to become Real’s all-time leading scorer, helping himself to four Champions League title wins in the process. How exactly does one follow up on that? Well, Madrid don’t usually seem too short of money and it looks like work is already underway for the Spanish giants to bring in some big names in a number of areas, not just up front. Starting in goal, Marca claim a £30million deal for Chelsea goalkeeper Thibaut Courtois is ‘more than close’ in what looks an ideal addition for a bargain fee to bring in an upgrade on Keylor Navas as number one. One of the finest shot-stoppers in the world, Courtois has just had a very solid World Cup with Belgium, helping his country finish third, and he’s shone in La Liga in the past with Atletico Madrid, so will be no stranger to Spanish football. In defence, Alvaro Odriozola has already been signed at right-back after emerging as a top young talent at Real Sociedad, but Raphael Varane’s form for World Cup winners France surely shows there’s no need to bring in another defender alongside Sergio Ramos this summer. In midfield, Calciomercato link Los Blancos with a bid of around £102m for highly-rated Lazio midfielder Sergej Milinkovic-Savic, who could be a perfect long-term replacement for the ageing Luka Modric, whilst also possibly giving new manager Julen Lopetegui another option over Toni Kroos, whose form dipped somewhat last season, even if only by his incredibly high standards. Still, there’s certainly room for Milinkovic-Savic after his eye-catching displays in Serie A which have seen him linked with a host of other top clubs for much of this summer. Finally, in a superb double swoop up front, the Daily Star claim Real are in pole position to sign both Chelsea forward Eden Hazard and Bayern Munich goal machine Robert Lewandowski for a combined £300m. That may be a total of £432m spent on new players, but it builds Madrid a potentially more well-rounded team than the one that finished third and so far behind La Liga champions Barcelona last season, whilst also enjoying, let’s face it, a huge slice of Loris Karius-shaped luck to beat Liverpool in the Champions League final. 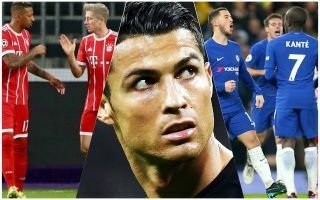 Ronaldo himself may be impossible to replace individually, but an attack of Hazard and Lewandowski supported by Milinkovic-Savic in midfield and a better goalkeeper keeping things tight at the back means the European champions will surely remain a major force next season if they get these deals done. While he’s no Ronaldo, Lewandowski’ immense record of 254 goals in his time in the Bundesliga shows he may well be the closest Real can get to replacing their former star’s goals.